The closer you look at fungi the more you see; and the more you look closely at tree trunks and branches the more fungi you see. 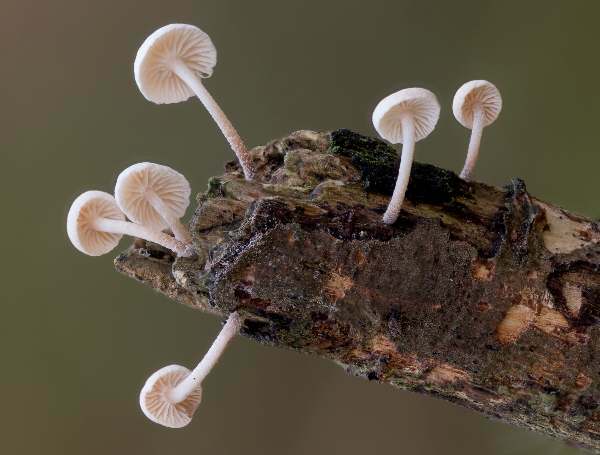 Some little mushrooms are so tiny that they are often overlooked or assumed to be some of the numerous blob-like ascomycetes of millimetric dimensions. Many of the tiniest cap-and-stem mushrooms fruit on dead twigs - even those attached to living trees - and so it’s important to look up as well as down when wandering through woodlands in search of new finds. Very common throughout Britain and Ireland, the Twig Parachute is also common and abundant in northern and central mainland Europe, becoming less evident in the Mediterranean region. This mushroom was described in 1788 by the French mycologist Jean Baptiste Francois (Pierre) Bulliard, who named it Agaricus ramealis. (In the early days of fungal taxonomy, most of the gilled mushrooms were included initially in a huge genus Agaricus; later many new genera were erected into which the majority of species were transferred, so that nowadays the genus Agaricus is rather more manageable!) 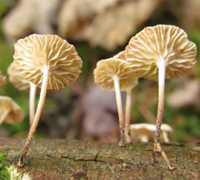 It was the German-born mycologist Rolf Singer who, in 1946, transferred this species to its present genus, thus establishing its currently-accepted scientific name Marasmiellus ramealis. Synonyms of Marasmiellus ramealis include Agaricus ramealis Bull., Agaricus amadelphus Bull., Gymnopus ramealis (Bull.) Gray, Marasmius amadelphus (Bull.) Fr., Marasmius ramealis (Bull.) Fr., Marasmiellus amadelphus (Bull.) M.M. Moser, and Micromphale rameale (Bull.) Kühner. 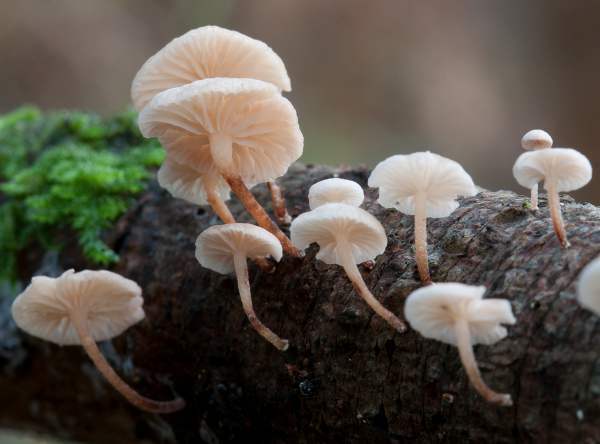 The genus name Marasmius comes from the Greek word marasmos, meaning 'drying out'. 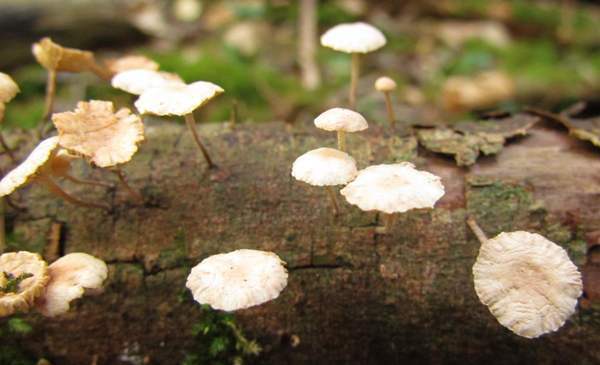 Elias Magnus Fries, who separated the Marasmius genus from the similar white-spored Collybia fungi, used as a key differentiating factor the ability of Marasmius mushrooms to recover if rehydrated after drying out. Fries called this characteristic 'marescence'. 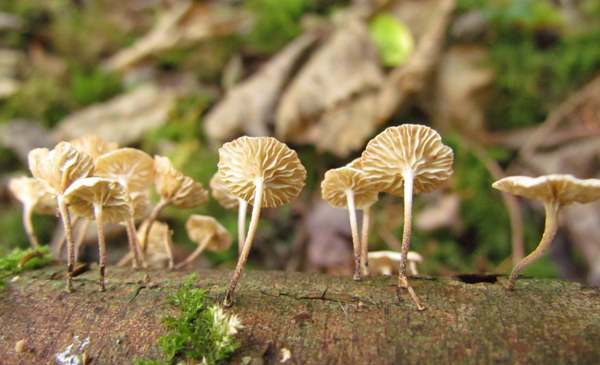 Fungi such as the Twig Parachute are placed in the genus Marasmiellus because they are 'like Marasmius species but even smaller'. The origin of the specific epithet ramealis is implicit in the prefix ram- meaning branch. Thus the tendency of the Twig Parachute to grow on dead twigs and small dead branches is reflected in the name ramealis. White or pale cream; convex initially, flattening at maturity; radially wrinkled at margin; 0.3 to 1.5cm across. Pinkish-white, turning ochre when old; adnate; narrow; distant. 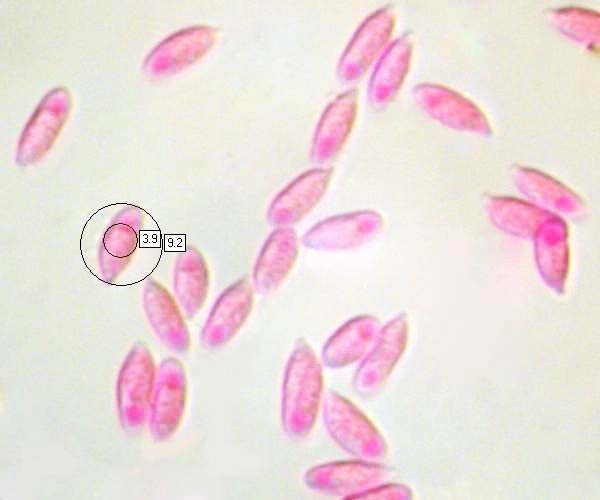 Upper stem is concolorous with the cap, but it becomes a darker brown near to the base; slightly scurfy; delicate; 0.5 to 2cm long and typically 1mm dia; no ring. 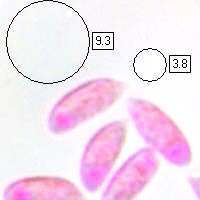 Cylindrical or bean shaped, smooth, 7.5-11 x 2.5-4μm; inamyloid. On dead twigs fallen from conifers and from broadleaf hardwood trees or on dead attached twigs; also commonly seen on dead bramble stems. 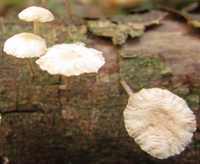 Marasmius androsaceus, known as the Horsehair Parachute, has long, thin black stems. Marasmius rotula has it gills joined not directly to the stem but to a collar surrounding the stem. These tiny mushrooms are of not known to be edible, and in any case because of their diminutive size they are of no culinary interest.